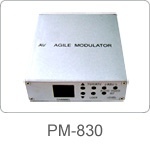 PM830 is one of high quality, lower price agile modulator, which adopts SAW filter to set for exact frequency adjustment and stable performance. It will be used in building, personal family, plant and CCTV etc. • PLL technique with high precision. • Clamp circuit with high anti-hum performance. • Adopt MMIC circuit and surface-mounted technique on key parts. • Support all CATV/TV channel.